Our range of products include ptfe roller coatings. Our organization is engaged in offering a comprehensive range of industrial roller coatings, PTFE Roller Coatings or PTFE Non-stick Coating Roller Coatings that has excellent non-stick properties. These materials have the highest operating temperature of any fluoropolymer and can operate at 260°C and have an extremely low coefficient of friction coupled with good abrasion and chemical resistance. We provide coatings in either single or two-coat system, comprising of a primer and topcoat. The surface has a high lubricity and the coatings are available in aqueous based forms. PTFE coatings are used for various engineering applications particularly those relating to non-stick (release), low friction, chemical resistance and wear resistance, there are many other solutions that can be resolved by the application of PTFE coatings. 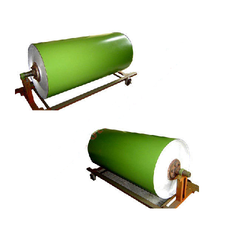 Moreover, these industrial grades of coatings are widely used in plastic industries, textile drying rollers and have excellent non-stick properties.